It is thought that Osiris may have been an actual leader in prehistory who was loved and respected by the community. 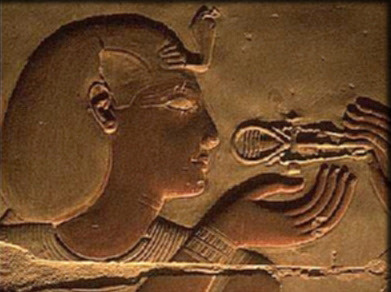 Since his name is associated with the Nile - as a source of fertility - and with the death and rebirth of the land, he may have led his people to an understanding of the benefits of water control and crop rotation at a time when organized farming was first being introduced. When Osiris was killed by critical and jealous opponents, the sorrowing community who had followed him as a just and enlightened leader honoured him in death, when a form of ancestor-worship developed. It is not known where Osiris ruled. The most prevalent and widely accepted belief is that is was in the province of Djedu (near Abusir Bana) in the middle of the Delta, where the district was named after him: Per-Usire, or House of Osiris, which was rendered into Busiris by the Greeks. However, the earliest rulers of which we have historical evidence came from Thinis, neighbouring Abydos, and Osiris, the deified ancestor, came to have a prominent place there from early times, overshadowing Wepwawat, the wolf-jackal, the first god of the area. The Thinite leaders slowly spread their influence. They moved southwards as far as Nekhen (Gr. Hierakonpolis), near the modern town of Edfu, which became the pre-dynastic capital of Upper Egypt, and northwards towards the Delta. A large macehead excavated at Nekhen records a military victory of an Upper Egyptian king (known as the “Scorpion King”) over the chieftains of the Delta (symbolically depicted as dead birds hung from Upper Egyptian standards). The main theme of this macehead is agricultural; the central register shows the king wielding a hoe in both hands and breaking ground amidst scenes of rejoicing. Unification of the Two Lands has been attributed to Narmer (Menes) who was also a native of Thinis. He was the first pharaoh to be shown wearing the Red Crown of Lower Egypt in addition to the White Crown of Upper Egypt. According to tradition, when he chose Memphis - a site near the border between the T wo Lands - as capital, he diverted the river in order to render it more suitable for habitation. Therefore, although the palette symbolically depicted his triumph over the Delta on one side, and unification on the other, Narmer, too, was traditionally associated with water control Narmer and his successors of the ist and 2nd Dynasties (3100-2686 BC) ruled from Memphis (then known as the ‘White Wall’), and were buried in huge funerary monuments on the necropolis of Memphis (Sakkara). Nevertheless, they honoured their ancestral home. Among the barren hills west of Abydos they constructed impressive cenotaphs (1), where relatives and friends could make suitable offerings. With the passage of time, the legendary ancestor Osiris, and the half-forgotten kings of Thinis of the first two Dynasties, became associated in the minds of the people. The Nile valley dwellers, who traditionally honoured the graves of their forefathers, came to pay homage at the cenotaphs on the necropolis of Abydos in the conviction that Osiris was buried there. The ruins of the cenotaph of Hor Aha (who has been identified with Narmer, the first pharaoh of recorded history), show that it was brick-lined, and the underground chamber measured 12x9 metres. His successor, Djer, had an even larger structure of some 21 X20 metres. It was the latter cenotaph, of Djer, that came to be regarded by the ancient Egyptians as the burial place of Osiris. The central chamber of Djer’s cenotaph was surrounded on three sides by irregular chambers, and there is indication that the whole structure was originally roofed with wooden beams. Surrounding it were no less than 338 subsidiary graves, many with crude stone stelae recording the names of the deceased who died after the pharaoh. It is possible that they may have believed that to be buried near the tomb or cenotaph of their master would ensure them a happy afterlife themselves. During the Old Kingdom (2686-2181 BC) the centre of activity was at Memphis and Giza. But the great pharaohs did not neglect Abydos. Decrees were promulgated to safeguard the interests of the priests of sacred sites. There were endowments for meat and milk to be placed at the holy places on official feast days. There is evidence, too, that some of the pharaohs travelled to Abydos. Whether this was part of their official duties or a pilgrimage is not know n. There is a rectangular enclosure of crenellated brick, known as Shunet el Zebib (2) that is thought to date to the early Dynasties; and worth mentioning is that the only statue ever found of the pharaoh Khufu (builder of the Great Pyramid of Giza) is a tiny ivory statuette excavated from the area of Abydos. By the end of the 5th Dynasty (2345 BC) the name of Osiris had crept into the mortuary literature as an explicit example of rebirth; the deceased was referred to as ‘Osiris’, meaning deceased and reborn ‘like Osiris’. The earliest shrine at Abydos, however, was not in honour of Osiris but of Wepwawat, the wolf-jackal of the necropolis, whose function was to protect the dead from prowling animals at the edge of the desert. 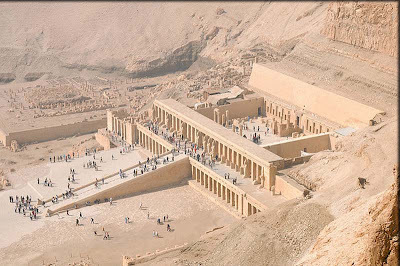 It was built by the 6th Dynasty pharaoh Pepi I at a site now known as Kom el Sultan (3).